FIFA Investigate Chelsea, Christensen, Morata, Arnautovic, Giroud and Cahill - The Chelsea Daft Vlog. In today's Chelsea Daft Vlog we focus on some important news articles that have featured in the last 24-hours. 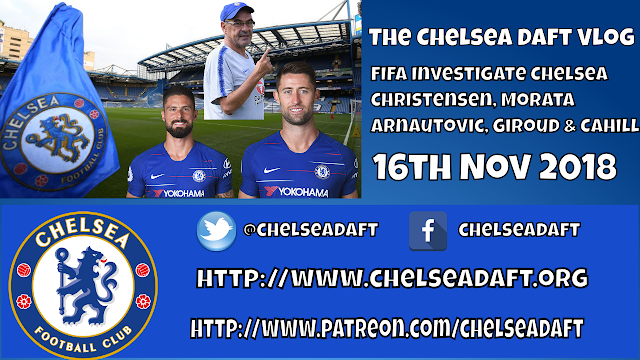 We look at the FIFA investigation which could lead to a FOUR window transfer ban, Andreas Christensen's frustrations, Alvaro Morata is happier than ever, Sarri looking at Arnautovic in January, Olivier Giroud to be loaned to Marseille and Gary Cahill given permission by the club to leave on loan. FIFA Investigate Chelsea - Looking at moves for Bertrand Traore and Andreas Christensen under age which the club have firmly denied any wrong doing at all - have issued a statement as such. If found guilty could lead to a fine and massive FOUR window transfer ban which would have a HUGE effect on Maurizio Sarri's plans. Andreas Christensen - Remains frustrated this season after last. When he has featured he has been disappointing and faces a fight for his place under Maurizio Sarri this season with David Luiz and Toni Rudiger set in stone. Alvaro Morata - Happier than ever at Chelsea and in life after speaking to a psychologist in the summer. Talks of training the mind and in good form - five goals in the last seven games. He just needs to stop falling over now! Marko Arnautovic to Chelsea? - Sarri looking at the West Ham striker as an option in January. Would he be a possible solution for us and fit into our style? A link-man maybe or someone in the same mould as Drogba or Costa? Olivier Giroud to be loaned to Marseille this January? - Loan move with a view to becoming permanent in the summer being talked about. Outstanding since he joined and gives us the alternative option. Scored important goals since he arrived but wonder if he fits into the team now under Sarri? Gary Cahill - Chelsea to allow him to leave on loan in January? - Club making a gesture due to fantastic service since he arrived six years ago. It's clear he is too slow and not good enough with the ball at his feet but he was never signed to be that player - signed to be an out and out defender and has been outstanding for us. He has won it all. What do you think about the articles/features covered in the Video? Have you say on everything Chelsea below. Have a cracking weekend and I'll see you all on Monday! UTC!